Chemical probes, are excellent devices for pool water treatment. When they are used together with an electronic controller, can help you prevent over or under feeding of your pool disinfectant. These devices greatly enhance your pool water treatment through precision analysis. Together these devices react very quickly to respond to any changes in your swimming pool or spa. Working together, they will determine when and if more chemicals should be feed into your swimming pool. Turn a chemical feed pump on or off. Open or close a pool circulation valve. Automatically switch a swimming pool circulation to its backwash circle. Operate a chlorinating feed system. Automatically turn on your pool lights or pool pump. Controlling these systems are accomplished by an expert installed chemical feed control system. The first step in automating your chemical feed system, is to measure the chemical factor or parameter that is to be controlled. This we accomplished using a highly sensitive chemical probe. Chemical sensors or probes operate by sending signals back to the electronic controller, which operates your chemical feeders. Through this process, your swimming pool sanitizing chemicals are introduced into your pool or spa water system. To ensure that your automated system works to its full capacity, make sure that you only use the chemical sensing probes that were designed to work with that particular make and model controller. Failure to do so, can result in false readings which can caused too much or too little pool disinfectant being feed into your swimming pool or spa water. Chemical probes used in swimming pool monitoring! pH probes - Which monitors the pH levels in your pool or spa water. ORP probes - this probe is sometimes referred to as redox. ORP stands for Oxidation Reduction Potential. Looking at each of these chemical sensing probes more closely, will reveal why its so important to use the correct chemical probes designed to work with the controller. Chemical pH probes - As I mentioned earlier, the pH probe is used to measure the pH level in your swimming pool or spa water. The pH measurement is the activity of hydrogen ions surrounding a thin-walled glass bulb at the tip of the probe. 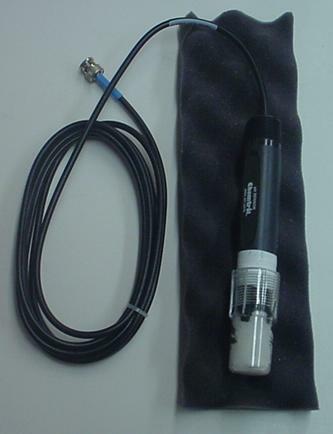 A pH sensing probe produces a small electrical voltage, usually about 0.06 volt per pH unit. This voltage is measured and then displayed as pH units on your meter or automatic pool controller. 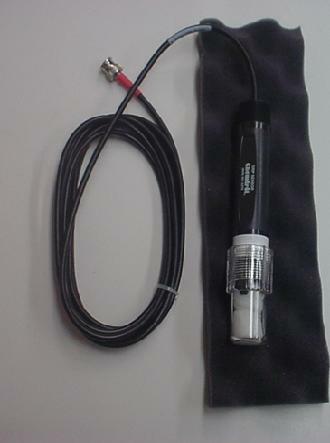 Most pH probes consist of a body, an electrode, and a cable that connects it to the controller. As you can see from the photo below. Now if your pH sensing probe is installed more than 20 feet from your automatic chemical controller, you have to use a preamplifier which will ensure that the proper signal is sent to your pool monitor. The readings of a pH probe can be affected by one of two possible ways. Your pool water's pH and the output signal from the probe's electrode, will both be changed with temperature differences. These two effects together or separately, can cause errors in the control of your pH measurements and in your calibrations. The pH probe has a chemical sensing element, that has a thin membrane which allows H+ ions to pass through. The electrode of the probe is also filled with a neutral solution or an equal amount of H+ or OH- ions. Whenever the pH probe is immersed in an acidic solution, H+ ions pass through the membrane. This causes a positive potential on the chemical sensing electrode to be developed. This potential difference between the sensing electrode and the reference point is measured with a pH meter. It is then displayed on your automatic pool controller as a pH read out. Now if your pH chemical probes are immersed in an alkaline solution, then a higher concentration of H+ ions will exists within the probe. The concentration of ions inside the pH probe is more than that found outside the probe itself. This reading causes the H+ ions within the probe to pass through its membrane; thus, leaving an excess of OH- ions within the probe. This causes a negative potential to be sensed by your pH meter. Again this will be displayed on your pool automatic controller as a pH readout. ORP Chemical Probes (Oxidation Reduction Potential) - A simple ORP monitoring control system consists of two chemical probes. One of these as I mentioned earlier, is your pH sensing probe. The other is your ORP probe which measures your pool chemical disinfectant levels. These probes together, controls your chemical feed pumps. An ORP probe which is sometimes referred to as a Redox, indicates the oxidizing/reducing capabilities of your spa or swimming pool water. An ORP chemical sensor measures the electron activity of your pool or spa water. A reducing agent (in case you did not know) is a substance that is capable of donating an electron. On the flip side, an oxidizing agent is one that is capable of accepting an electron. Something we need to remember though - there can be no oxidation without simultaneous reduction. Because ORP chemical probes measure the activity of electrons in water, the probes must be both chemically inert and a conductor of electrons. ORP chemical probes or sensors are very sensitive; therefore a lot of care goes into the construction of these sensors. ORP probes are usually constructed using platinum materials. However in applications where the reducing agents or solutions are very strong, gold is often the material of choice during construction. ORP probes only measure the ratio of oxidized to reduced forms of all chemicals in your swimming pool. Calibration of your ORP probes should be carried out using a known standard solution. The truth of the matter is that this is the only way the ORP reading will be of any use to you. Amperometric probe - Amperometric probes, are chemical probes that are used to detect the change in the sanitizer residual levels in swimming pools. It accomplish this by measuring the amount of current that flow between the electrodes found within the probe. Amperometric chemical probes respond more quickly than most other probe sensors. They have a more linear response to changes than ORP probes to the chlorine level in pool water. The construction of an amperometric chemical sensing probe, consists of a membrane that protects the sensing surface of the probe itself. This type of construction greatly reduces the frequent fouling up of the probe during its operation. Currently amperometric chemical probes are much more expensive than the more commonly used ORP probes. These type of chemical sensors are relatively new to the North American pool and spa industry. Amperometric probes and controllers are used widely in the treatment of drinking water and control in swimming pool care in Europe. These chemical sensing probes are also being used in the automated treatment of residential spas. The location of your pool chemical sensing probes is very important. You can not achieve an accurate control of your pool chemical dosing unless your chemical probes provide you with accurate readings. One key factor in achieving an accurate probe reading, is the source of the water to be measured. The source water to the probe's chamber should be from a pipe line downstream from your filter. If you use unfiltered water, it will cause your flow cell to become clogged or plugged. This will cause your probes to become dirty much quicker. Whenever this happens, your chemical probes will provide you with inaccurate readings or measurements. The return water line from the flow cell should, not be plumbed directly into the suction side of your swimming pool filtration pump. The fact of the matter is that the vacuum that is created in the system, may damage your chemical probes. The source water to your probe's chamber should be installed upstream from your swimming pool heater. Truth be told...the changes in your pool water temperature can affect the accuracy of your pool water measurement. The source water to your probe sensing chamber should be upstream from your pool chemical injection point and into your pool's circulation line. The chamber for your chemical probes should not be installed in direct sunlight. Cleaning your chemical sensing probes is vital because it ensures that you get continued accurate readings and it ensures longer life of your probes. This cleaning process is very important especially if you are using cyanuric acid regularly as a chlorine stabilizer. Your ORP probe is one of the most commonly used probes for measuring disinfectant levels in swimming pool care. Sadly ORP probes foul or get dirty very quickly. This causes the ORP read out to change, even though the true ORP of the pool water does not change. Because chemical sensing probes get dirty, manufacturers of these swimming pool monitoring devices provide special cleaning instructions in their manuals. When do probes require cleaning? 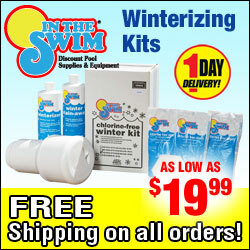 A slow response to the changes in the level of sanitizer in your swimming pool or spa water. A low or inaccurate read out on your automatic controller. Your probes get dirty when materials found in your water, accumulate on the surfaces of the probes in a thin film. This thin film is often invisible to the human eye; thus, given you the sense that there is nothing wrong with your probes' sensing capabilities. The frequency at which your ORP probes foul up varies from swimming pool to swimming pool. The fouling up or false reading depends on what is present in your pool water and on the chemical probe itself. Components that can cause false readings from your chemical probes. In swimming pool care, the fouling up of a chemical sensing probe can occur within days or in some cases weeks. As I mentioned earlier, manufacturers have included detailed step-by-step instructions in the maintenance and proper cleaning procedures of their probes. If you are a pool operator/manager, it is good practice to properly train your staff on these cleaning instructions. Also it is good practice to the have instructions posted near the controller unit for quick reference. Turn off the power to the automatic controller. Remove the probes separately from the flow cell or chamber. Gently scrub the tip of each probe with a clean soft brush, such as a toothbrush. Use any mild detergent such as a hand soap or toothpaste. Re-install the probes and restore the power supply to the automatic controller. In some cases, the fouling up of an ORP probe is so rapid that the use of an automatic probe cleaner is more desirable than cleaning them manually. Some manufacturers make their own automatic ORP probe cleaners. These automatic probe cleaners are designed to help resolve the fouling up or inaccurate reading of the probes. This helps in providing you with prolong use of both your pH and ORP chemical probes. Chemical probes help control your erosion feeders in pool water treatment! Copy Right © 2008 by WWW.Swimming-Pool-Care.Com. All Rights Reserved. Spend more time relaxing & less time cleaning with an Automatic Pool Cleaner!